The epic quest that washed up as a message in a bottle. As Sean was standing with his feet buried in the sand something caught his eye. In the captivating scenery of Halong Bay, there was an item that managed to divert his gaze away from the limestone monoliths that pierce skywards from the sea. An object, bobbing along in the lapping waves. It drifted in towards shore and then became lodged at the edge of the beach. Sean stared for a moment then stepped forward to pick up the object – an old, wax-sealed glass bottle. Inside was a quest. A list of endeavours that would change the travels of a solid group of new found friends for the rest of their adventures. An epic quest delivered as a message in a bottle. The discoverer of the quest, Sean. In this modern age of social media and constant virtual connection it can be hard to find a true human touch. On the beaches of Castaway Island in Halong Bay this old-fashioned occurrence, the kind that you only see in movies, came true. Like a story straight out of Hollywood, four girls from New Zealand wrote out a list of challenges on tea-stained paper and locked it in a bottle, throwing it into the oceans of Vietnam. With around 1600 islands in Halong Bay, as well as hundreds of ‘junk’ boats, fishing vessels and passenger ships trawling through the inlets, this bottle could have ended up anywhere. On any deserted island, or smashed up against the rocks. It ended up on Castaways. The girls who penned the quest wanted the finder to complete the challenges and then make their own up, passing on the idea to another lucky soul. We have decided to take it a step further. The beach that the bottle found itself on. Along with many of our compadres on the Castaways Tour, we are going to take on the girl’s quest. Only we have decided to open it up to the masses. An idea this awesome deserves to be spread around the world. We are going to complete the quests and update our progress on our NOMADasaurus Facebook page. But we need your help. Take on this epic quest for yourself. Complete the challenges. Send us your photos and we will publish your personal quest as well. Finish off what the girls created and then start your own one. Put it in a bottle and throw it out to sea. Leave it behind in a busy street. Place it at the top of a mountain. Keep the positive vibes flowing throughout the planet. Castaway Island – the final home of the girl’s message. Channel your inner Robin Hood and give to the poor. Choose one food item and eat it every meal for that day. Milk an animal that’s not a cow by hand. Dance in a crowded public place like no one is watching. Save a life (open to interpretation). Wear fancy dress for a whole day for no reason. Busk for half an hour in a busy city street with homemade instruments. Follow Rafiki – he will show you the way. 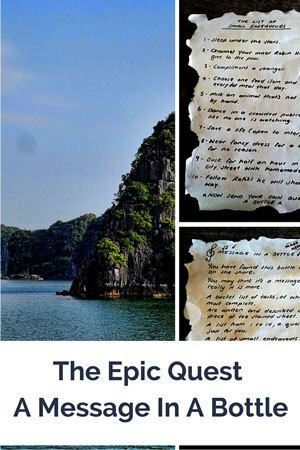 The original pages of the quest are now sitting behind the bar at the legendary Castaway Island, run by Vietnam Backpackers Hostel. They will be left there to inspire others to take on this incredible challenge. But you don’t need to visit Halong Bay to take part. You don’t even need to be travelling. Get out there now. Go dance in a public place. Get dressed up for no apparent reason. Take some photos, shoot a video. Send it to us here at NOMADasaurus (contact (at) nomadasaurus (dot) com ). Make sure you complete every single challenge! Don’t let life be mundane – spice it up. There is no real reason not to take part in this epic quest. Have fun with it! Follow Rafiki – he will show you the way! So i am one of the girls that wrote the messege in a bottle! And my sister just found a facebook messege from a Sean saying it had been found, which as it turned out was about 10 days after we threw it over our boat as we left Halong Bay. And now you wrote this epic thing trying to get traverlers to complete the list which is awesome! You started something amazing Kate! Nice work. So stoked Sean found your message. Hi! I am the mum of Kate and Anna Liddington who wrote the Quest message in the bottle with their awesome friends. I cannot describe how fabulous it is that you found the bottle, and not only completing the quest but passing it forward on a universal level! This could become a life changing experience for everyone who is touched by this. Please consider one day travelling to New Zealand and staying with our family since we are now connected in the most incredibly unique way! I like it! Asking people to step out of there comfort zone. Were there any contact details for the girls that wrote the letter? a few things off the list themselves! Hey Anna! Great to hear from you. Shame our paths didn’t cross in Vietnam, but perhaps we’ll get to meet you one day, somewhere in the world. In the meantime, we will continue to tick these quests off and then send out our own one! Haha this is so cute!! Wow, what a find! The milking quest is going to be the funnest, I think. We’ll be on the hunt for something hilarious to milk 😀 Hope you join in the shenanigans as well! Thanks for reading, Martina.